Have you ever wanted a big chest that match with nice biceps? It might also come with wide set of shoulders which look more like doors. Do an upright row, it’s an effective body building exercise if you’re aiming to get what the type of body I have mentioned. Why? Well, the upright row enhances your trapezius muscles, side deltoids, rhomboids, and front delts. Putting this exercise into your routine will help you enhance your shoulder and upper back. Well it is quite difficult if you would do it the wrong way, not to mention the injuries you would suffer. Well, there are two ways to do it, the normal upright row, and the Smith Machine upright row. Doing an upright row ﻿﻿normally is fine, but doing it with a Smith Machine is way better. Remember that the weight of the plates would depend on how much weight you are willing to lift for a start, you can start with 25 pounds and work your way up. Take the PVC pipe or broomstick, hold it with a grip that is wide enough you can pass the thing over your head and also behind your back. Do this 10 times and it will surely warm up your muscles and lessen the chances you would get injured while lifting. Stand up with a straight back and a shoulder width stance. Keep your chest out and your eyes straight. Hold the Straight bar using an overhand grip and raise the bar slowly towards your chin. Once your upper arms become parallel with the floor, stop pulling and start lowering it down slowly. Remember that this workout would tremendously help ﻿﻿improve ﻿﻿your ﻿﻿shoulders﻿﻿, It is better if you throw more shoulder targeted routine with this one. As I have said in the previous guide, you can start with the weight you are willing to lift for a start. 1. Using a PVC or broomstick, do the warm up routine on the previous guide. 2. Set the straight bar on the Smith Machine. The height must be with the same level as the middle of your thighs. 3. Once you are sure with the height, put the plates in place. 4. Hold the bar using a pronated grip with your shoulders width apart. 5. Start the routine by lifting the straight bar up, fully extend your arms and keep your back straight. A slight bend would be needed on your elbows. 6. As you exhale, use your side shoulders to lift the straight bar. 7. Keep the bar close to your body as you raise it up.Continue to lift the straight bar until it reaches your chin. 8. Once it reaches your chin, slowly move the straight bar downward. When doing this routine the conventional way, be extra careful with the weight you lift. Aside from having a bad form, too much weight can cause serious injuries. If you really want to have that body you have always dreamed of, do not cheat yourself while doing any routine. While doing this routine, always remember that your elbows must be the ones driving the motion. Keep your elbows higher than your forearms. Keep your torso still and do a small pause every time the bar gets to your chin. If you already have shoulder injuries, please do not do this routine, it will totally mess up your shoulder condition. Either your doing a Smith Machine upright row or the conventional ﻿way of doing an upright row, you may use an E-Z bar, barbell. You can also use dumbbells but that one is for advanced lifting, do it only if you are familiar with the right execution. 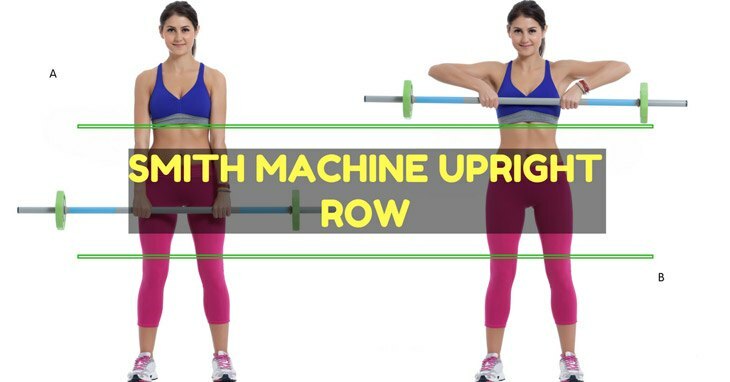 Conventional way of upright row is good. But for me, doing a Smith Machine upright row would be the best. Not just upright row, but most routines which can be done on a Smith Machine would be good. Why? It may not be considered a natural exercise but using ﻿﻿a Smith Machine would provide you with a big pace change using just your usual routines. I have said it is not a natural way to exercise because the plane of motion is fixed when using a Smith Machine. And experts say it’s unnatural for the body to exercise in a fixed plane, yes it has a fixed plane but that same problem would help a lot of people who want to focus their workouts on a single muscle group. You certainly would have a hard time doing this the natural way. Another good thing about this is, you can still do routines with the Smith Machine even if you have slight back injuries. These are just some of the good things that the Smith Machine can offer. A Smith Machine upright row would be the right routine to do if you ask me. It will not be as hard as normal upright rows since the Smith Machine is there to back you up a bit. You would have the perfect stance doing this routine on a Smith Machine. Doing so would lessen injuries and you can also add a bit more weight without thinking too much about having injuries, But still, be very careful with adding weight, the Smith Machine would help a bit but it will not do the heavy lifting for you. And I would want to add that lifting is good, but keep an eye on what you eat. Diet is also important when it comes to building that great body you want. I hope you learned something from our Smith Machine upright row guide. Leave a comment below and be sure to share this to your friends, remember that sharing is caring.